Orioles and arborists could wholeheartedly concur on one thing. Planting palms in the wrong location can be a tragedy waiting to happen. This is particularly true in suburban areas where some palms pose safety and liability risks. Let’s spell out the complexities. Palm owners often hire tree pruners annually for a number of reasons. Dead fronds of some species can spontaneously fall. Their weight and spiky edges can mean significant injury to anyone in the way. Dead fronds also don’t suit the aesthetics of ‘paradise.’ They can attract ‘messy’ birds, scorpions and rodents. And their fruit (which some wildlife eat) pose yet another problem when they fall. They are a hazard to pedestrians and stain sidewalks. When does palm fruit appear? You guessed it! About mid-summer. Just when the oriole is raising its family in a semi pensile nest affixed to the backside of a frond. Its accidental destiny can be a chipper. 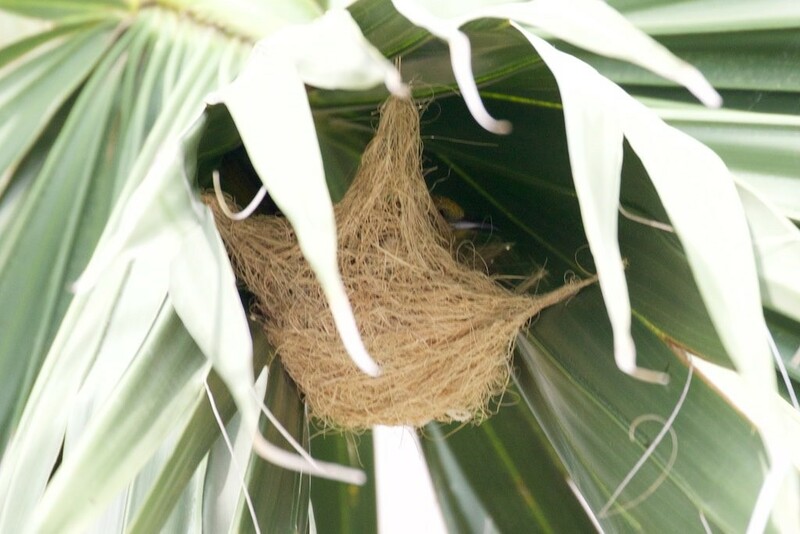 For that matter, the oriole’s neighbors (several cavity-nesting species, a kingbird, finch, bats and other small mammals) may also be nesting in the palm and be at risk. We don’t really need to explain why the arborist is asked to remove both fruit and dead fronds at the same time, do we? Tongue in cheek—To date, no one has come up with a way to sue an oriole for following its natural instincts and failing to grasp the preferences of man, thereby taking up residence where it is not welcome. But since the arborist and palm owner can be sued for negligence in protecting the public, the oriole unknowingly settles into a trap. By ending up in a chipper, the oriole not only loses its current offspring but the future generations of those offspring. Taking the long term, wide-scale view, we see that either by accident, negligence or habitat destruction, this is how species fall into decline and ultimately become extinct. But let’s pick up where we left off. 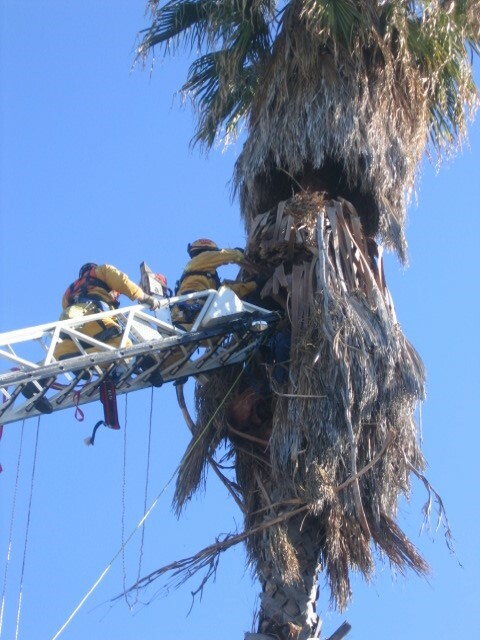 Be aware, the arborist takes his life in his hands to reduce the liability of the palm owner. Climbing palms poses unique dangers. Highlight this in your mind. It is critical that palm pruning be left to a trained person not a handyman or gardener who may be cheaper to hire. If an interlocked ring of dead fronds weighing hundreds of pounds collapses on a tree climber, death occurs from suffocation or falling. This happens more often than the public recognizes. There’s more to know. On a windy day in dry, high fire-risk regions, dead fronds are known to be ignited by embers. They are sails without a ship and can carry fire for miles. Or for that matter, they may hit power lines and start one. Knowing all this, oriole, arborist, palm owner and the entire community can now agree--palms in suburban areas can be a tragedy waiting to happen. So, when is the best time to work in palms? If you ask birds and want to rule out any risk to them---in the fall and winter, after their young have left the nest. 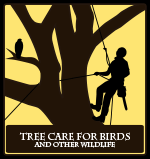 At the very least, before work proceeds, tree care providers have a responsibility to look for birds coming and going from the palm and even if none are seen, to remain on the lookout as work proceeds (Harming an active nest of a native bird is a violation of the Migratory Bird Treaty Act in CA.) A consulting wildlife biologist may be necessary to determine the best course of action if birds appear to be nesting. But when you ask property owners when palms should be managed--the answer depends on the risks associated with site and the climate conditions alluded to previously. Some species of birds learn from nesting failures, including those repeatedly caused by humans, but one can’t help but wonder how parent birds are to learn from our inconsistent management decisions or when we ‘invite’ them with one hand and kill them with another. Prevention? Choose palm species carefully and avoid planting in locations where expectations are unrealistic, potentially unsafe for people, and put wildlife unnecessarily at risk. Wise planning can also avoid damage to property and lower cost of annual maintenance. 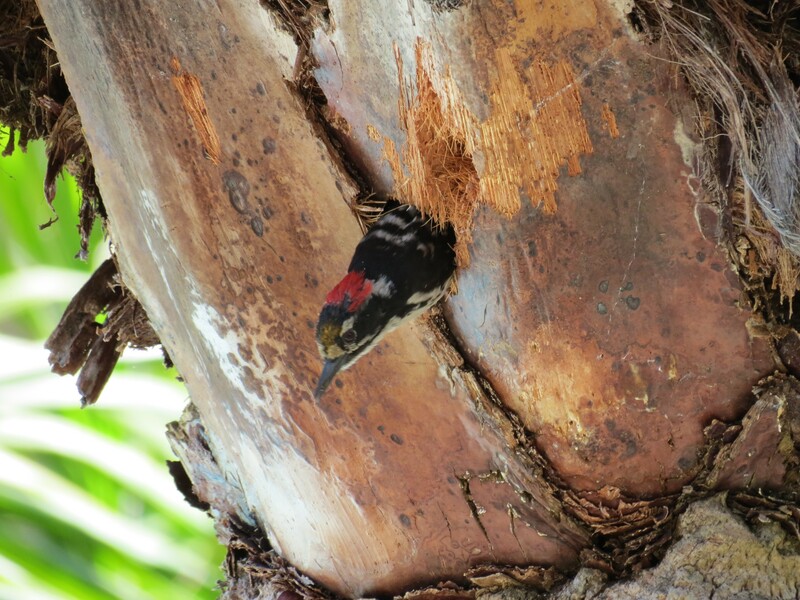 Bird advocates can support property owners and tree care providers by informing them of active nests in palms and offering to notify them when the birds have left. Positive partnerships can go a long way in reducing the impacts of human folly.